VINCENNES—Twenty-five seminarians made a pilgrimage on Aug. 12 to Vincennes, Ind., the place where the Church in Indiana began 175 years ago. That is when the Servant of God Bishop Simon Bruté came to minister in what is now known as the Old Cathedral Basilica of St. Francis Xavier, a church that was built in 1826. 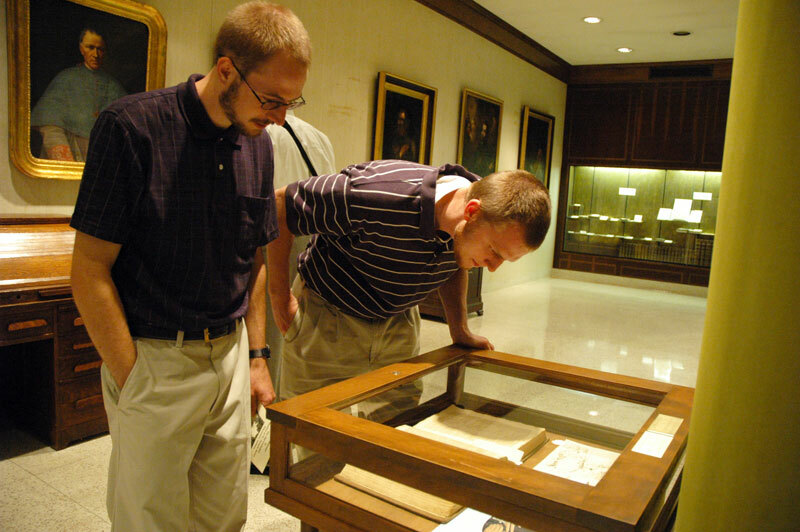 Father Johnson said that it was important for the men who are discerning if God is calling them to serve the Church in central and southern Indiana as priests to visit the place where it began. Lutgring had previously been a seminarian for the Lafayette Diocese and had been in formation at Mount St. Mary’s Seminary in Emmitsburg, Md., where Bishop Bruté had ministered before being appointed the first bishop of Vincennes. Seminarian Michael Keucher, a member of St. Charles Borromeo Parish in Bloomington who is a first-year philosophy student at Saint Meinrad, said Bishop Bruté was an important part of his life of faith. But the seminarians weren’t just focused on the past during the pilgrimage. It was the conclusion of a three-day retreat for them at the start of their academic year. They spent the first two days at Our Lady of Fatima Retreat House in Indianapolis. Seminarian Phillip Rahman, a member of St. Boniface Parish in Fulda and a sophomore at Bishop Simon Bruté College Seminary in Indianapolis, spoke about the importance of spending time with his brother seminarians.